This is particularly true for Siri on HomePod, which performs well in certain areas but is largely limited to the amount of actions it can perform on the speaker itself. This led Apple’s HomePod to become relegated to the “bottom of the totem pole” in an AI assistant performance test during Loup Venture’s smart speaker research in February, with Siri answering 52.3 percent of 782 total questions correctly, across the same five categories as the new test. Loup Ventures grades each digital assistant on two metrics: “Did it understand what was being asked?” and “Did it deliver a correct response?” Questions came from five categories, including Local (example: “Where is the nearest coffee shop?”), Commerce (“Can you order me more paper towels?”), Navigations (“How do I get to uptown on the bus?”), Information (“Who do the Twins play tonight?”), and Command (“Remind me to call Steve at 2pm today”). Questions were asked of Siri on an iPhone running iOS 11.4, Google Assistant on a Pixel XL, Alexa on the iOS app, and Cortana on the iOS app. 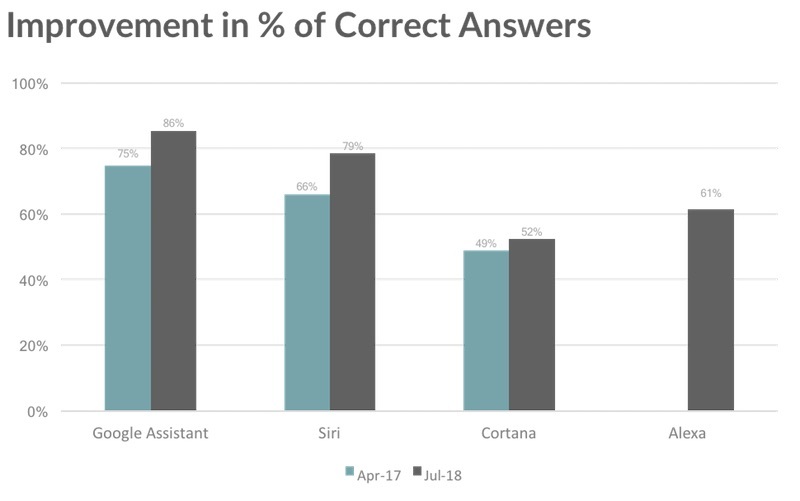 Siri’s best category was Command (90 percent of questions answered correctly), outperforming all rivals when asked to control aspects of the iPhone, smart home products, Apple Music, and more. Following Command, Siri performed well in Local (87 percent), Navigation (83 percent), and began dipping in Information (70 percent) and Commerce (60 percent). Google Assistant has the edge in every category except Command. Siri’s lead over the Assistant in this category is odd, given they are both baked into the OS of the phone rather than living on a 3rd party app (as Cortana and Alexa do). We found Siri to be slightly more helpful and versatile (responding to more flexible language) in controlling your phone, smart home, music, etc. Our question set also includes a fair amount of music-related queries (the most common action for smart speakers). Apple, true to its roots, has ensured that Siri is capable with music on both mobile devices and smart speakers. 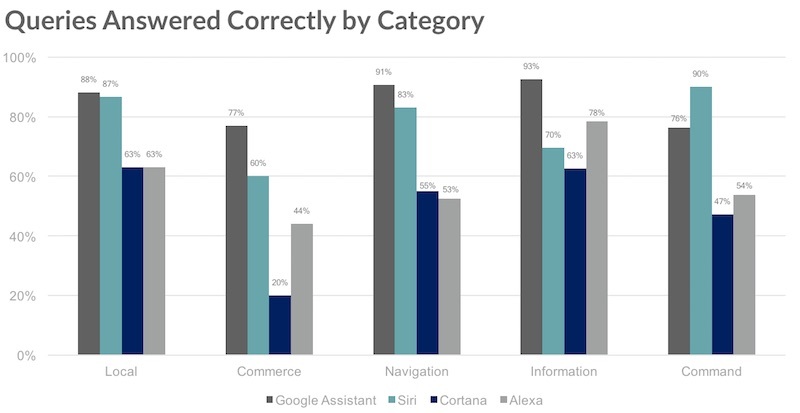 Google Assistant was the top digital assistant in all categories except Command, with Loup Ventures particularly liking Google’s “featured snippets” feature that reads off search results of voice queries and is often “exactly what you’re looking for.” Both Alexa and Cortana were lesser performers in the test due to the iOS app for each limiting what the assistants can do on an iPhone, unlike Siri’s ability to perform tasks all over iOS and not just in one app. Loup Ventures also sees more improvements coming down the line, particularly for Siri. This fall, the digital assistant will gain new abilities with Apple’s upcoming “Siri Shortcuts” feature in iOS 12, which will let users create automations between apps that can be easily triggered through voice commands. The researches say they are “eager to test that feature” when it launches within iOS 12, likely coming in September.